We were recently contracted by Airbus to shoot video of the A350 XWB on its first arrivals into Sydney & Perth. The aircraft was MSN5 (the 5th test aircraft in the fleet) and it was in the middle of its world tour of route-proving flights, demonstrating that it could make the required long haul legs that its initial customers would be performing (including the all important turn-around times after landing). 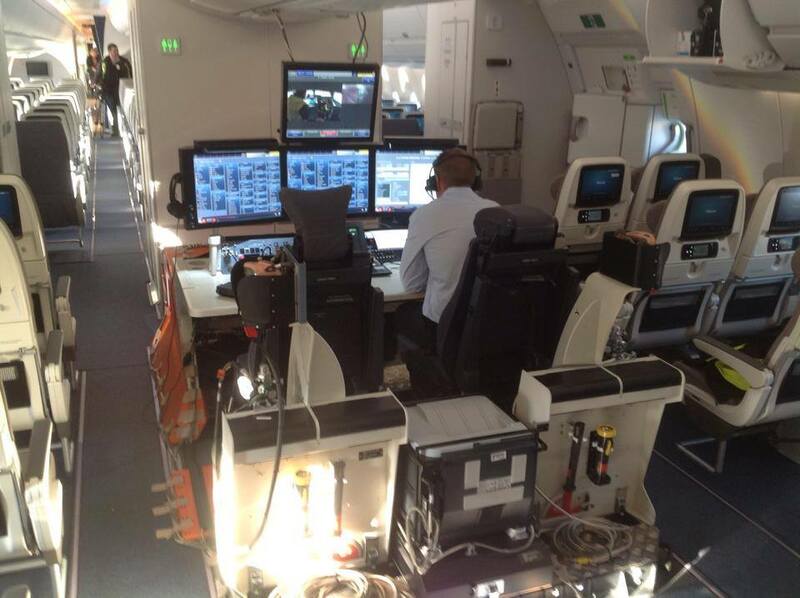 While MSN5 had passenger seating, overhead bins, In Flight Entertainment, galleys & bathrooms installed, it also had plenty of test equipment on board including a large engineering station around the middle of the cabin & air data samplers through the various cabin areas. Copies quantities of raw information was captured covering the operation of the engines, the crew’s inputs, the flight computer decisions and the air quality in each section of the cabin. At the end of each leg of the flights the data was exported to a hard drive & sent back to France for analysis. 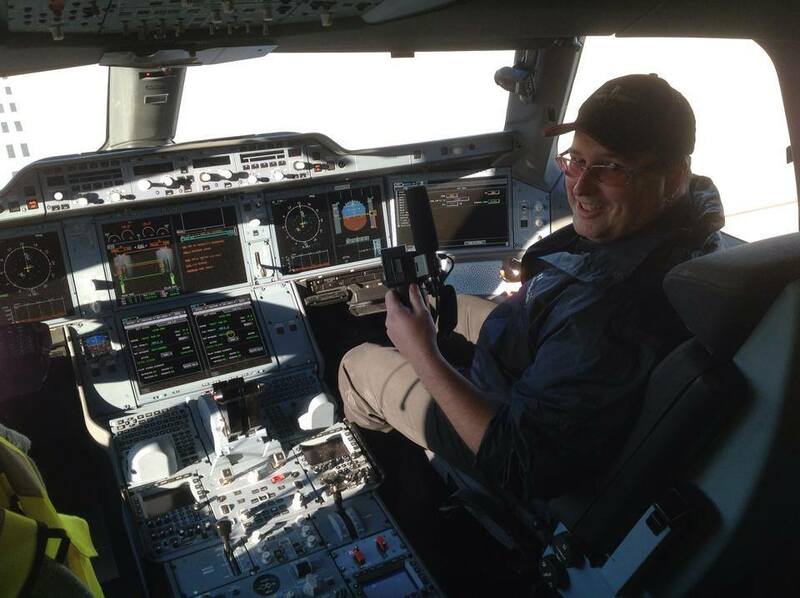 I got to check out the cockpit – very cool! The next morning saw us out on the tarmac eagerly awaiting the aircraft’s arrival. Well, almost all of us: I left my ASIC behind in Melbourne (DOH!) so I couldn’t join the guys out by the runway. Instead, I grabbed the train & went back to the domestic terminal then walked around to Gate 11 where media & guests were to be allowed in. As I was on the media list, I was able to get in to the special events area and set up well before the aircraft landed. We spent the day filming the aircraft’s time on the ramp including all the media & guests being shown through the aircraft. We also managed to record a couple of audio interviews and I managed to get a few minutes in the cockpit with its amazingly huge screens (& great visibility). When it was time for those flying on to Auckland to go through customs & immigration, I went with some of the media to get a Visitor pass so I could join the general group going by bus to be near the runway. Steve & Paul stayed with the aircraft for the water arch departure from the ARFFies and then wound up out near the runway but closer to the likely lift off point. Once the aircraft had departed, I joined Steve & Paul and we were dropped off at the domestic terminal to catch our flights home. 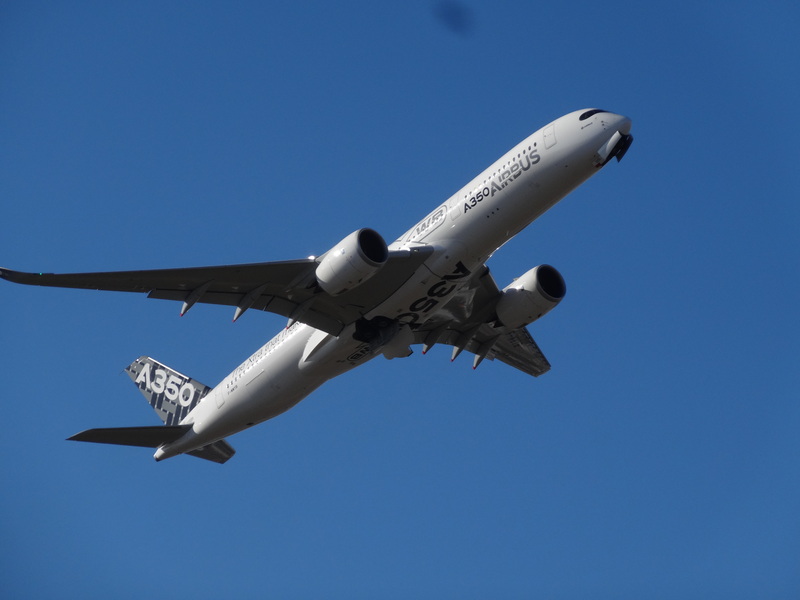 After going to Auckland, the A350 was heading to South America and then back to France. It would next return to Australia on Sunday as it arrived in Perth from Doha. It was scheduled to stay in Perth for a few hours before turning around & heading back to Doha and then on into Russia & Eastern Europe. For the Perth arrival, we also needed to take photos as well as video so Paul & I went over as camera operators while Steven Pam joined us as photographer. Our “WA Correspondent” Ben Jones also joined the team to help us with gear & ensure we kept a steady stream of content flowing on our Facebook & Twitter feeds. Steve stayed in Melbourne as he had prior plans for the weekend & couldn’t make it. 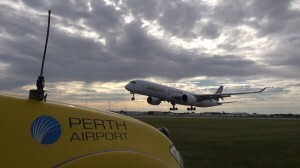 In Perth the aircraft was to be cleared of all staff although a group of guests were going through later in the afternoon. 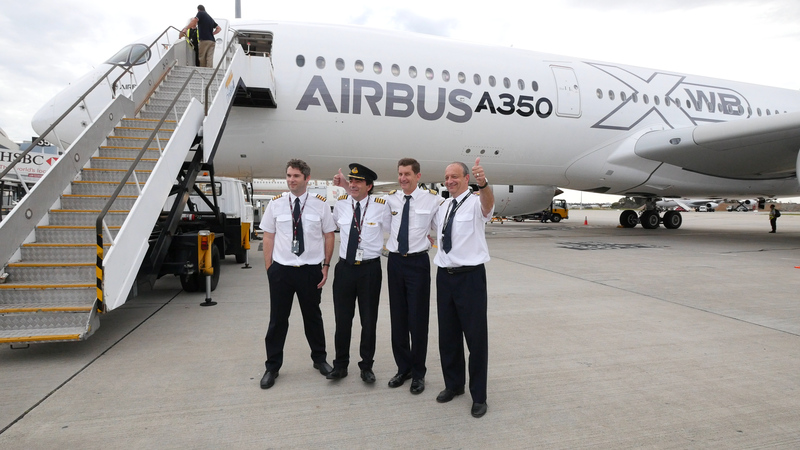 The Airbus media team on board would capture content from that visit so, as the aircraft wasn’t departing until 11pm, our work was done after a couple of hours. Despite all the running around, being paid by Airbus to go and capture content of cool aircraft has been a wonderful thing. It’s like getting paid to do something you love and would have done anyhow if you had the spare cash to cover the costs. Sure, there’s more planning & liaising plus higher levels of responsibility, not to mention all the post-event follow up tasks (uploading “best of” content, preparing & sending all content on hard drives, client liaisons, etc) but that’s all part of the gig. 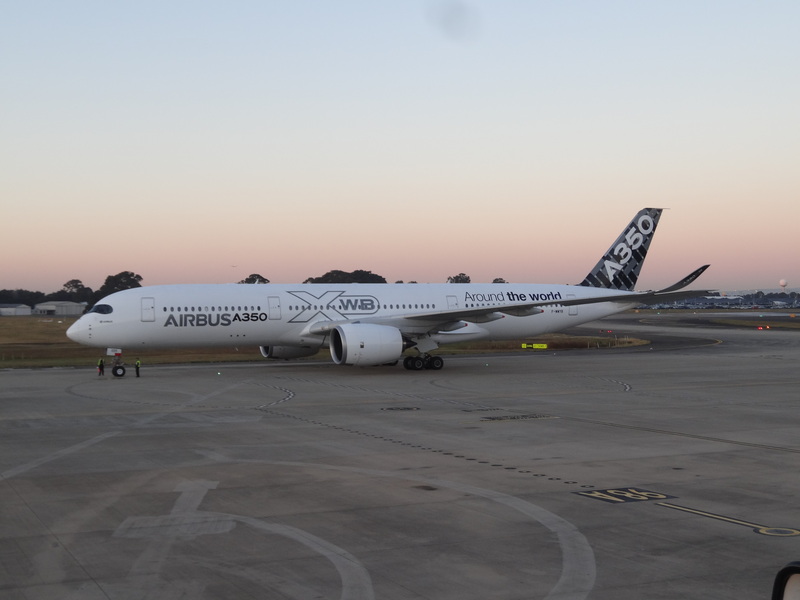 This entry was posted in Commentary, Video, Work and tagged A350, A350 XWB, Airbus, engineering, Ibis Budget Hotel, Perth, Qantas, route proving, Sydney, test data, video, Virgin Australia, YPPH, YSSY. Bookmark the permalink.